Tim Burton's The Nightmare Before Christmas started as a poem Tim Burton wrote while working as an animator at Disney in the early '80s. The Nightmare Before Christmas then became the first full-length stop-motion animated film ever created. The Nightmare Before Christmas follows Jack Skellington, the Pumpkin King of Halloween Town as he decides to spread Christmas joy to the world. But his well-meaning mission unwittingly puts Santa Claus in jeopardy and creates a nightmare for all good little girls and boys every where! Tim Burton's Corpse Bride carries on the dark, romantic tradition of Tim Burton's classic films. Set in a 19th Century European village, Corpse Bride is a stop-motion animated film that follows the story of Victor, a young man who is whisked away to the underworld and wed to a mysterious Corpse Bride, while his real bride, Victoria, waits bereft in the land of the living. Tim Burton's The Nightmare Before Christmas Charm Bracelet Tim Burton's Nightmare Before Christmas Charm Bracelet Sparkles with the Beloved Characters from Halloween Town! - Scary sights and fantastic frights await in this spooktacular Tim Burton's Nightmare Before Christmas charm bracelet available from The Bradford Exchange! Prepare to visit Halloween Town with its most famous citizens including Jack Skellington, Sally, Dr. Finkelstein and more in a delightfully charming Nightmare Before Christmas jewelry creation that is sure to scare up some smiles! Inspired by the critically acclaimed movie, Tim Burton's Nightmare Before Christmas charm bracelet features 8 handcrafted charms that capture all the crazy characters in Tim Burton's frighteningly fun style. Each character gleams in sterling silver plating with 24K-gold plated accents. Plus, colorful Swarovski(R) crystals give each individual charm sparkle while Swarovski crystal briolettes add to the shimmering effect. Hurry to own this Nightmare Before Christmas jewelry for yourself or give as a collectible Nightmare Before Christmas gift for any Halloween Town fan. Tim Burton's The Nightmare Before Christmas Tabletop Sculpture You're among the first to see this brand-new unique item, now available from Collectibles Today. But you must hurry for your best chance of availability. Quantities are strictly limited; don't delay! 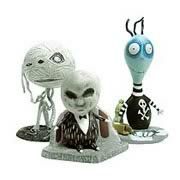 Walt Disney Classics Collection Jack Skellington: Accolades All Around Figurine Dapper Pumpkin King! Jack Skellington Figurine Pays Tribute to Another "Horrible" Halloween in Halloweentown, USA! - Celebrate the most macabre Halloween ever with the devilish denizens of Halloweentown - and the debonair Pumpkin King - with this nightmarish collectible Jack Skellington figurine. Masterfully sculpted by artist Patrick Romandy-Simmons, this ghoulish figurine is "plussed" with bronze hands and pewter arms and legs. Welcome Jack from "Tim Burton's The Nightmare Before Christmas" as he is shown triumphantly emerging from the town square fountain in this Walt Disney Classics Collection porcelain figurine. This ghastly figurine is meticulously crafted of fine porcelain and painted in a predominantly black-and-white color palette. Tim Burton's The Nightmare Before Christmas Village Town Collection Tim Burton's The Nightmare Before Christmas Village Town Collectible Will Make You Scream with Delight! - If you believe life's no fun without a good scare, then you'll be right at home with the first-ever Tim Burton's The Nightmare Before Christmas Village Town collection. Jack Skellington and all his extraordinary friends will be there to greet you starting with Issue One featuring Jack Skellington's House and a FREE Jack figurine. Soon you'll be able to enjoy the thrill of Issue Two, Dr. Finkelstein's Lab, which includes FREE Dr. Finkelstein and Sally figurines. Additional village buildings, each a separate issue and some with select free figurines and accessories, will follow.This limited-edition Hawthorne Village collection invites you to re-live the story of how Jack tries to bring the joy of Christmas to his hometown. Each devilishly detailed and hand-painted village building in your collection really lights up with ghoulishly glowing colors and is made complete with your FREE figurines and accessories inspired by the twisted holiday classic. Enjoy your own wickedly unique village decorations, inspired by the genius of Tim Burton! Tim Burton's Corpse Bride Village Collection: Lighted Indoor Halloween Decoration Tim Burton's Corpse Bride Village Collection is Wedded Bliss with FREE Figurines, Light Set! The Perfect Halloween Decoration - Say "I Do!" to a wedding fright night you won't soon forget! Introducing Tim Burton's Corpse Bride village collection, available exclusively from Hawthorne Village. Delight in the thrills and chills of this "spooktacular" illuminated Halloween decoration as Victor mistakenly takes the hand of the Corpse Bride in marriage. All the wonderful characters and buildings from the movie classic are here, beginning with Issue One featuring the Ball and Socket Pub and FREE Victor and Corpse Bride figurines. Soon, the haunts of your collectible lighted indoor Halloween decoration will continue with Issue Two, 2nd Hand Shoppe which includes a FREE Skeleton Band Leader figurine. Additional village buildings, each a separate issue and some with select free figurines and accessories, will follow.Inspired by the Academy-Award(R) nominated film of optimism and true love, this collectible Tim Burton's Corpse Bride village brings the characters and buildings to life in a decorative Halloween village collection that even lights up. There's Victor and the Corpse Bride, Victoria , the Skeleton Band leader, Maggot, Elder and more, each with meticulous handcrafting and hand-painting that's true to the otherworldly colors and look of the film. Complete with FREE figurines and accessories for the perfect collectible Corpse Bride gift. Tim Burton's Nightmare Before Christmas Express Train Collection Collectible "Tim Burton's The Nightmare Before Christmas" Train Set with FREE Track Set and Power-pack! Exclusive! - Fans of the Academy Award(R)-nominated movie "Tim Burton's The Nightmare Before Christmas" continue to thrill to memories of Halloween Town and its scary residents. What could be more frightfully delightful on a cold October night than an eerie train filled with these classic Nightmare Before Christmas characters? After all, life's no fun without a good scare, and you're guaranteed to get one when you step aboard this illuminated collectible "Tim Burton's The Nightmare Before Christmas" train set! Roar down the tracks (if you dare!) with this collectible electric train set, a Hawthorne Village first inspired by the 1993 movie. This collectible "Tim Burton's The Nightmare Before Christmas" HO scale model train set includes a FREE 16-piece E-Z Track(R) set and power-pack, a $60 value! The train set brings the movie to life in your home and makes a unique autumn and Halloween decoration. Frightfully high demand is expected, so order now! Tim Burton's Nightmare Before Christmas Village Town Subscription Plan Tim Burton's The Nightmare Before Christmas Village Town Collectible Will Make You Scream with Delight! Exclusive! - If you believe life's no fun without a good scare, then you'll be right at home in Tim Burton's The Nightmare Before Christmas Village Town. Jack Skellington and all his extraordinary friends will be there to greet you!Welcome to Tim Burton's The Nightmare Before Christmas village town. Re-live the story of how Jack tries to bring the joy of Christmas to his hometown with each devishly detailed and hand-painted building. They really light up with ghoulishly glowing colors! Your collectible village town is complete with figurines and accessories inspired by the twisted holiday classic - a $65 value that's yours FREE! Enjoy your own wickedly unique village decorations, inspired by the genius of Tim Burton! A Hawthorne Village limited-edition exclusive FIRST. Strong demand is expected. Order now. Welcome To Halloween Town Village Gate Accessory Set Tim Burton's The Nightmare Before Christmas Village Accessory Set Welcomes You to Halloween Town! Handcrafted! - Beware of what awaits you on the other side of this gate - it might be fun! This terrifyingly terrific two-piece Tim Burton's The Nightmare Before Christmas village accessory set will lead you to a place where your worst nightmares live - and here to welcome you is the Mayor himself, lighting the pumpkin lanterns in anticipation of Halloween! And just look at how marvelously the gate is decorated with all those scowling jack o' lanterns - so creepy!Brought to you by Hawthorne Village, this fabulous Halloween village accessory set is licensed by Disney. It is handcrafted and hand-painted in ghastly detail by master artisans, and creates the most delightfully frightful entrance to your Halloween village display, so don't delay! Jack Skellington Talking Figure This Jack Skellington Talking Figure of the hero from Tim Burton's The Nightmare Before Christmas stands 24" tall. Motion activated, it "speaks" well-known phrases from the cult classic. Fully posable with multiple points of articulation. Comes with display stand and pumpkin. 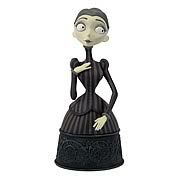 Corpse Bride Victoria Mini Bust Stands 7-inches tall and features a likeness taken directly from the film. Tim Burton's Nightmare Before Christmas Village Accessories Collection Tim Burton's The Nightmare Before Christmas Accessories Add De-Frightful Fun to Your Village! To-Die-For Exclusives! - Get set for some ghoulish fun! These Tim Burton's The Nightmare Before Christmas accessories are ready to make every night just as de-frightful as Halloween in your Nightmare Before Christmas village display! Once you get a hold of them, you'll agree - they're simply to die for!Available exclusively from Hawthorne Village, each of these collectible Halloween village accessories is meticulously handcrafted and hand-painted with perfectly spooktacular accents to a village already brimming with nightmarish mayhem. Beginning with Set One - "Filled with Fright" you'll love finding a ghostly home for each intricately detailed Nightmare Before Christmas character figurine! They glow, they grimace, they're wickedly unique decorations for Halloween or any Tim Burton fan! Order now!